Need technical support or want to know more about specific StarTech.com products? Click here for the latest drivers, updated information, and more. Want to know where to buy StarTech.com products or how to become a reseller? Our Customer Support resources help make it easy to place an order, access your account and order history, or answer questions about shipping. Click here for the FAQs and ordering support resources you need. Find product related materials such as drivers, manuals, certifications, and data sheets. Where do I find the Product ID? Have questions about StarTech.com products and services? Our FAQs answer product-related questions you may have before buying, including installation instructions, how-to guides and troubleshooting steps about our products and technology. Where are StarTech.com's product drivers located? How do I create a StarTech.com account? How do I reset my StarTech.com account password? Which payment methods does StarTech.com accept? Learn more about StarTech.com products before you buy or install them. These videos can help make installation and setup easy, and provide common troubleshooting steps. How to find the product ID? All StarTech.com product IDs can be identified by a combination of letters and numbers. 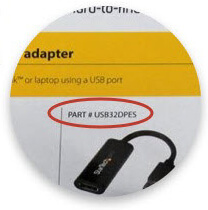 For example, such as USB2VGAE3 or USB32VGAEH. Typically, the product ID can be found on the unit itself, but it can also be found on the packaging it came in. On the product itself, it can often be found on the bottom of the unit, near either "StarTech.com" or the serial number. If the product came in a box, this can often be found near the product photo after the word PART #. It may also be located above the UPC code or on the front of the packaging. If you require assistance finding the product ID, please contact our Technical Advisors for assistance.